Artlure angling, in short, is basically the use of artificial bait imitations to catch a variety of freshwater species of fish. It is used to target a wide range of fish species from Barbs to Barbel in South Africa. Artlure angling is becoming increasingly popular in South Africa and is closely related to fly fishing and spinning as well as finesse type fishing such as freshwater dropshot and Bass finesse fishing. Artlure is normally fishing with light tackle, small/light spinning rods up to 7 feet, with light line, small coffee grinder reels and artificial baits, generally with smaller hooks. Artlure is used to target a variety of South African freshwater fish species which differs from bass and trout angling where you normally setup to target those species specifically. Barbel and Tigerfish are arguably the most sort after fish when it comes to artlure anglers and plastic fish imitations, small poppers and deep diving lures fished slowly are the best way to target these fish. When it comes to Artlure though, I prefer to fish extra light 7lb line, size 2000 reel and 6 foot rod and target a variety of species using hooks between the sizes of 16 and 8. For this I use plastic minnows, grubs, worms and paddletails (The type of lures you find when you buy a child's rod set) they are deadly! You can expect to catch almost any fish this way. A split shot placed about 10cm above the hook will give the lure some action and help you with casting distance. 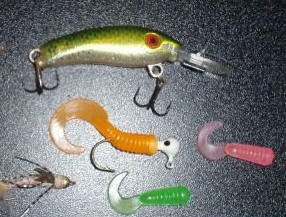 Alternatively you can use a small jighead and attach the lures in the same way you would when dropshotting for Bass. Hard plastics are my favourite lures to fish without a doubt and the smaller lures are deadly for species such as Yellowfish, Barbs, Kurper and the smaller Barbel. Crankbaits, diving lures and small poppers are effective. I normally fish with lures between 1cm and 5cm in length, obviously the bigger lure you through into a dam or river the less species you can target. When I cast 2cm Lures I use a similar method with a split shot attached 10cm above the lure. It gives the smaller lures and soft plastics a wounded bait fish imitation and the fish hit them hard and it also helps you with casting distance. The bigger lures such as 4/5cm poppers and crankbaits are good for Barbel; and Bass will strike them as well and the occasional Yellowfish. Remember when throwing these lures to maybe gear up to 10lb or 12lb line as big Barbel will take these lures and you want to give yourself the best chance of the landing these fish. It is important when Artlure fishing to locate areas where you think there would be fish holding. Reed and grass beds are superb environment for many small species of fish and if you are catching regularly on a small hard plastic or a small soft plastic it might be worth while to gear up and throw some bigger lures to see if there are any fish that will be prepared to take the lure. Papermouth and Largescale Yellowfish can be very greedy when feeding on the plastics and they will have no problem hitting a lure half their size. The Three Spot Barb is also a candidate for doing this. Artlure is a great method to catch freshwater fish in South Africa and its a lot easier in terms of maneuverability as you can pack light and walk around. More articles coming soon! Watch this space!